One often hears critiques that the justice system is "racist," and even those who hesitate to use that word must acknowledge that it produces discriminatory outcomes. The 21st century culture-war debates around #cjreform frequently are less about whether the system discriminates so much as whether there exists ill intent. Or whether, when discriminatory outcomes are so persistent and ingrained, the actors' "intent" even really matters. When one examines the system closely, however, discriminatory outcomes aren't universal. They're more prevalent in some parts of the system than others, and one of the biggest sources of discriminatory outcomes is the Drug War. The Texas Criminal Justice Coalition just put out a new data tool for analyzing criminal cases in Harris County since 2010, and it provides a useful starting point for demonstrating this observation. For example, looking at countywide DWI data since 2010, we find that 13.8 percent of defendants were African American. Black folks make up about 19 percent of Harris County residents, so that's actually a lower proportion than their share of the population. By contrast, when we look at marijuana arrests over the same period, we discover that a whopping 48.5 percent of defendants were African American. 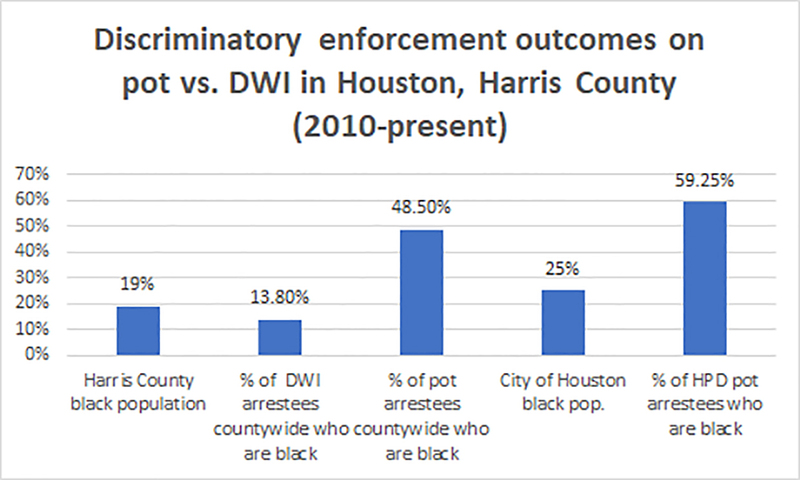 Digging deeper to analyze results by agency, 59.25 percent of people arrested for marijuana by Houston PD were African American, 46.8 percent at the Harris County Sheriff, and 29 percent at smaller PDs in the county. IMO, the difference here is that DWI arrests are mostly made as the result of fairly solid probable cause: Cops see someone swerving across lanes or smell alcohol on their breath at a traffic stop. OTOH, it's hard not to conclude that there's more discriminatory targeting of black folks in the realm of drug enforcement. 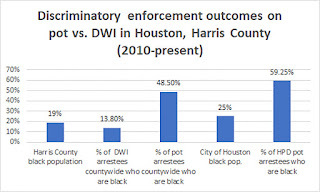 How else can HPD explain why nearly 60 percent of pot arrestees are black compared to a quarter of the city population? Nothing else but discriminatory enforcement makes sense to explain these data. When Gov. Greg Abbott recently endorsed reducing marijuana penalties, he framed the issue as one of efficiency, wanting to keep pot smokers from needlessly filling up local jails at taxpayers' expense. But reduction of pot penalties can just as easily be framed as a racial-justice priority. In fact, both can be true at the same time. A recurring theme on this blog, dating back to its earliest days, is that some of the strongest, most politically resilient reform proposals (and public policies, generally) are those with enough ambiguity to their meaning so that different constituencies can credibly tell themselves different stories about them without a fundamental contradiction. Reducing marijuana penalties fits that bill. For liberals and libertarians, penalty reduction is a credible next step on the road to legalization, a goal prioritized in the state Democratic Party platform. It will eliminate more than 60,000 arrests statewide - disproportionately African Americans - the very first year the law is enacted. And it will contribute significantly to decarceration goals at Texas county jails. For fiscally minded conservatives, those 60,000 defendants are costing taxpayers' needlessly for jail and indigent defense at a time when counties are complaining of unfunded mandates. Make the crime a Class C misdemeanor and the county neither must pay for their incarceration nor hire them a lawyer. So this is a "mandate" from which the Legislature could relieve county taxpayers. Both these things can be true without either group of supporters disagreeing with the outcome of their allies' thinking, even if they may disagree with the priorities and ideological suppositions that got them there. With the Governor's endorsement, Texas appears poised to finally reduce user-level marijuana penalties in 2019. Because they're racist. And because they're expensive. And inefficient. And discriminatory. And unfair. And because many people want to legalize it entirely. And because all those things can be and are true without being mutually exclusive. There's a little something in this policy for everybody. Absolutely agree with 9:49. Lawmakers are too focused on their personal moral agenda to see the writing on the wall and reflect the majority will of Texas voters. It's only a matter of time to full legalization. Why not now and enable law enforcement to focus on crimes that hurt people and property? Maybe now the price for pot will drop to a reasonable level. Not everybody can afford it. What about quality control - some of that stuff ain't pot. When the laws no longer reflect the will of the voters do we have a representative democracy in Texas?